The minute Dobet Gnahoré (pronounced DOH-bay gna-OR-ay) steps onto the stage, it is obvious she is something special. She exudes an inner strength and commanding presence that draws you in, even before she has opened her mouth to sing. Once Dobet does begin to sing, her voice is filled with emotion and range. She moves from heartfelt ballads to funky, danceable songs with ease, and is comfortable performing in a wide range of African styles. engaging aura reserved for artistic greats. After masterful performances across Europe and the United States, she has become one of African music’s most exciting young talents. Given Dobet’s upbringing, it should come as no surprise that performing comes so naturally. Dobet’s father, Boni Gnahoré, is himself a master drummer, actor, and singer who is well respected across the Ivory Coast, where Dobet was born and raised. Her father was an original member of an influential artist colony called Village Ki-Yi M'Bock, which was formed in 1985 in Abidjan, the bustling capital city of the Ivory Coast. At the age of 12, Dobet announced to her father that she wasn’t going to return to school. Even at that young age, Dobet knew that she wanted to devote her life to music, dance, theater and other performing arts. “I want to stay in the village like you!,” she asserted so forcefully that her father knew there was no talking her out of it. From that day forward, Dobet spent her days studying music, dance, theater and percussion, learning from her fellow residents in the village. The trajectory of her life changed when a young French guitarist named Colin Laroche de Féline arrived in the village one morning in 1996. With a backpack over one shoulder and a guitar over the other, Colin had come to discover this unique community. Planning to stay only three days, he ended up staying three years, having fallen in love both with the village’s artistic lifestyle and with Dobet. Colin mastered a range of African guitar techniques and he and Dobet formed a musical and romantic bond that made them inseparable collaborators. Together, they began to compose songs that earned the attention of other members of the village, as well as regular guests such as African stars Ray Lema and Lokua Kanza. Colin and Dobet called their duet Ano-Neko (which means “create together” in the local Dida language). While the artistic colony was a utopian hideaway, the city of Abidjan became embroiled in social and political turmoil. Seeking a more stable and less dangerous environment in which to raise their child, Dobet and Colin moved to France in 1999. In Europe, the couple formed a band and developed a relationship with Contre-Jour, a small but influential management company based in Belgium that has helped develop the careers of a number of successful world music artists. Soon, the group was performing at European music festivals, and Dobet’s unique talent began grabbing people’s attention. She earned a nomination for Best Newcomer from the BBC World Music Awards in 2006, and her debut album, the 2004 release Ano Neko, received wide accolades. In the fall of 2006, Dobet joined Malian guitarist Habib Koité and South African troubadour Vusi Mahlasela on Putumayo’s Acoustic Africa tour, which was presented across Europe and the United States. Sharing the stage with these two established African icons, Dobet astounded the audiences with her exceptional talent. Earning raves from everyone who saw the show, Dobet left no doubt that she was a star in the making. For her second album, Na Afriki (To Africa), Dobet offers a personal vision of Africa today. 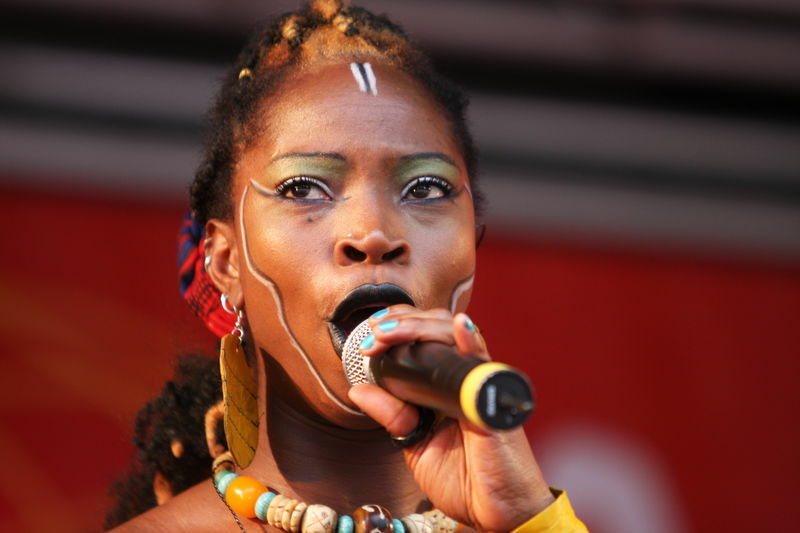 Performed in a number of different African languages, the songs address social and political issues: the struggles of women in African society, the exploitation of children, the impact of greed and violence on the family. Dobet calls upon Africa to seek solutions from within and draw upon its own vast resources to create a better future. She sings of love and loss, as well as joy and celebration, using a wide variety of rhythms and styles that reflects her unique pan-African approach. Dobet, Colin and their young daughter now live in the small French town of Givet near the border with Belgium and not far from the headquarters of Contre-Jour. Other artists on the Contre-Jour roster such as Habib Koité and the Gangbe Brass Band of Benin pass through the area frequently to rehearse and record. In many ways they have created their own version of an artistic community, far in distance from Village Ki-Yi M'Bock in the Ivory Coast, but close in spirit.